This quote speaks right to the heart of the Southern Accents team. Not only do we have a team of creatives at SA, but, we have also surrounded ourselves with creative people who we collaborate with on a regular basis. While the heart and soul of Southern Accents is the rescue of salvageable architectural elements and antiques, we are also all about finding creative ways to repurpose some of the materials that we rescue. This is one of the areas where we can allow our creative juces to flow! 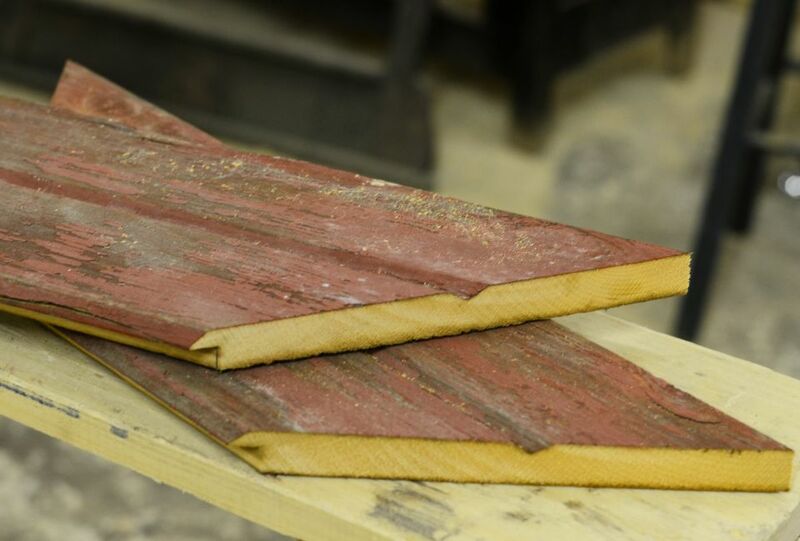 Salvaged wood has become an increasingly large part of our business. As this side of our business continues to grow, so does our pile of wood cutoffs! We hate to discard anything so, we are always looking for ways to repurpose these wood scraps. Thanks to the talents of team member Josh Howe and local artist Leldon Maxcy, we currently have a wonderful collection of salvaged wood items that have been created from some of our wood scraps. You’ll find wall art cutouts of the state of Alabama as well as Cullman county. We have a new selection of custom made wood frames. We also have a collection of salvaged wood items from Josh which include beautiful cutting boards, honey dippers and even a night lamp… all made from salvaged wood. For all you DIYers… we have something just for you! We’ve started packaging our wood cutoffs into craft packs. 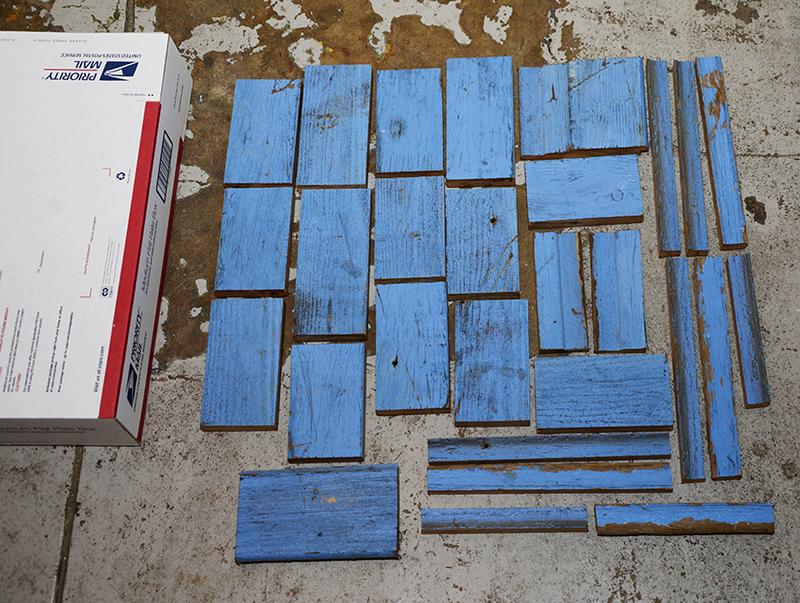 Each 12″ x 3.5″ x 14″ Priority Mail box is full of your choice of salvaged wood pieces. 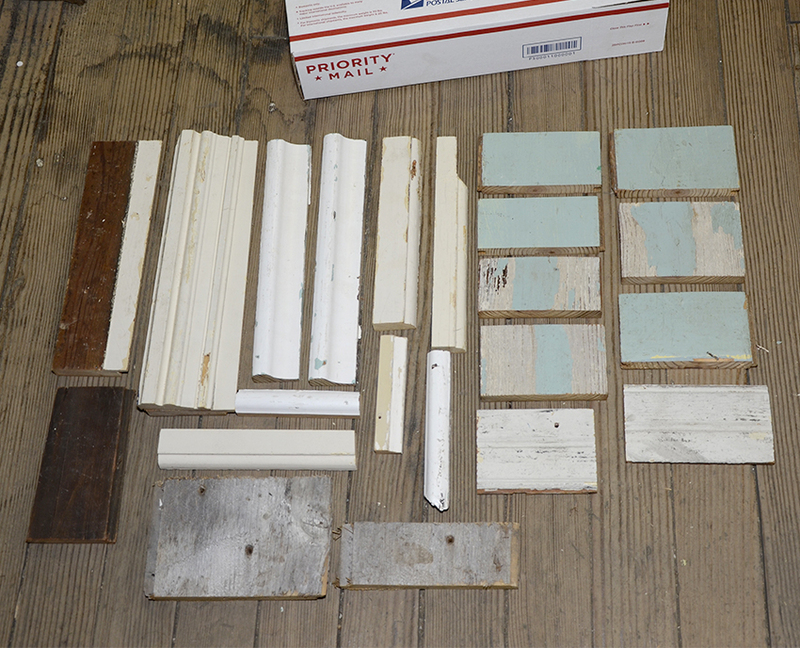 Choices include painted wood in colors of blue, white, green, natural, or a multi colored mix. 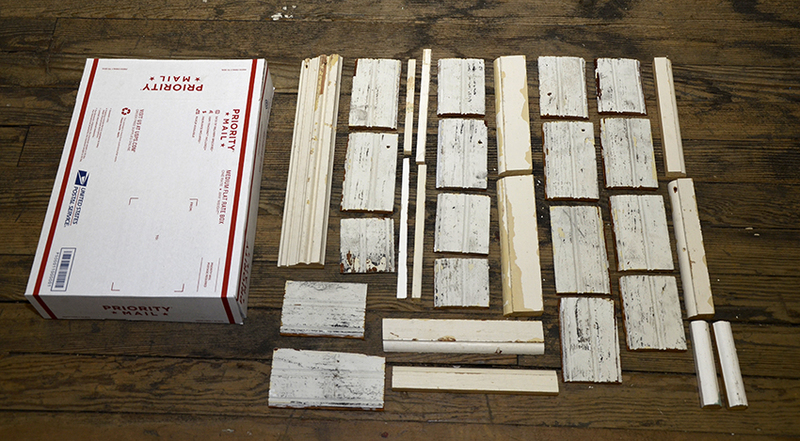 Each pack could contain a mix of wood, beadboard and trim pieces. The packs are ready to ship and can be used to create your own work of art! Give us a call at 877-737-0554. Have your credit card ready, let us know your color choices and your box will be on it’s way!! 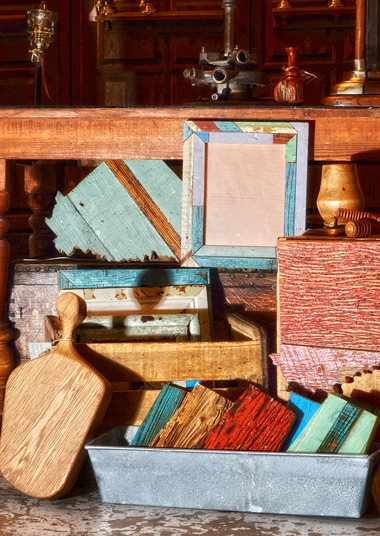 Stop by our showroom or visit us online at sa1969.com and take a look at our selection of salvaged wood art and craft packs. Art work starts at $25 and the craft packs are $24.95 plus shipping. Southern Accents has an incredibly talented team of artists and craftsmen who are constantly coming up with creative ideas. Recently, we decided to add a bit more interest to a four panel, round top door that we custom built from cypress wood. SA Team member Josh Howe came up with the idea of covering the panels with patina’d copper. He had several scrap pieces of shiny copper in the wood shop. All that was needed was a method of aging the copper. Josh did a little experimenting and the end result was so fantastic that we decided to share his recipe! The process of aging the copper so that it gives off that lovely blue/green hue is fairly simple. It is a matter of treating the copper with an acid then allowing it to oxidize. The specific form of acid used will result in different color changes within the copper. While there are several chemical compounds you could purchase, Josh used a mixture of common household ingredients: vinegar, ammonia, and kosher salt. Josh started with a clean, quart sized spray bottle purchased at our local hardware store. He filled the bottle with approximately 1/2 inch of salt. He then added equal parts of vinegar and ammonia to the bottle, leaving enough room at the top to be able to throughly shake the mixture until the salt was completely dissolved. The copper was cleaned and degreased using a lacquer thinner. The cleaned sheets were then taken outside and sprayed with the acid mixture and placed in the sun to dry. Heating the treated copper speeds up the oxidation process. While we took advantage of a sunny day you could use something as simple as a hair dryer to heat the metal. Depending on the desired result, the copper may need more than one treatment. Once the desired color was achieved, the copper was rinsed with warm water, dried, and sealed. If the copper is to be used outdoors we recommend a spar urethan which offers UV protection. For interior use, any clear sealant will do. When treating the copper, if the desired color change is not achieved with multiple treatments, scuffing the copper just a bit with a piece of steel wool will open up the metal pores allowing it to more readily absorb the acid mixture. The copper we used was originally purchased from a local air conditioning company and was approximately 1/16″ thick. You can also use copper flashing from the hardware store. Do not however use the copper foils commonly found in craft stores as these are too thin and the acid will likely eat a hole right through these sheets. The method we used is one of many that could be used to create a lovely patina on copper. This process is not limited for use on copper sheets, but can be used to antique any copper item. Old copper pots, pans, pennies, bowls and other finds you may want to use as decorative items can be treated using this method. To add another dimension to your creation, before you treat the copper with the acid solution, paint on a design using a cotton swab and petroleum jelly. Every spot covered in the petroleum jelly should remain shiny! Copper is such a versatile metal. In addition to the beautiful colors it emits when oxidized, it can be etched, hammered, and molded into almost any shape. We’ve added a board to our Pinterest page filled with crafting and DIY projects using copper as well as a few pins on additional ways to add a gorgeous patina to this fabulous metal! With Southern Makersa little over a week away, we’ve been working non-stop to prepare for this exciting one day festival which will take place May 3rd in Montgomery, Alabama. Like last year, Southern Accents is once again instrumental in the design and construction of the entrance, the stage, work shop area, and covering the “dumpster” wall. We are also busy designing and constructing our own booth, as well as the booth for fashion designer Billy Reid. The clothing racks are a great solution for studio apartments or areas where storage space is limited. The Billy Reid booth needed a way to display clothing and accessory items in their booth. 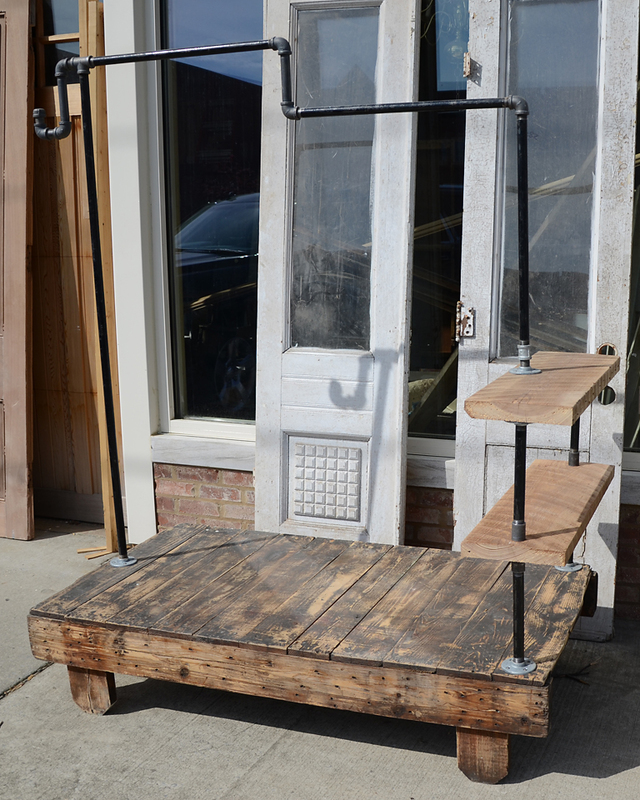 Recently, we ran across pictures of industrial looking garment racks made from salvaged wood and galvanized pipe. These pictures got our creative juices flowing! 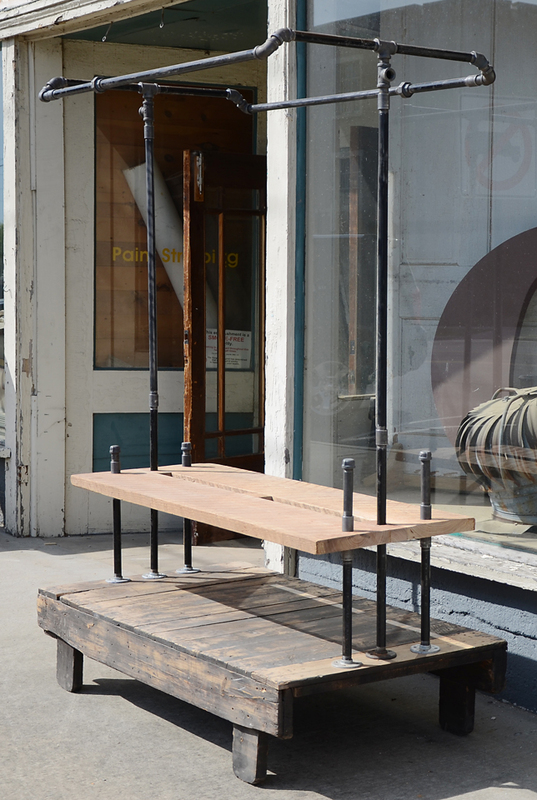 We have around 50 salvaged industrial tables in our inventory. We immediately knew that these tables, which are 33″ wide, 5′ long, and 13″ tall, would provide the perfect base for our clothing racks. We decided to build three racks, each one a little different from the other. The industrial tables have a dark, wood stain, so after the design we lightly sanded each table just to clean it up a bit. The wood base provides a great way to lift shoes and other accessories up off the floor. We decided to add shelving to provide additional storage space. 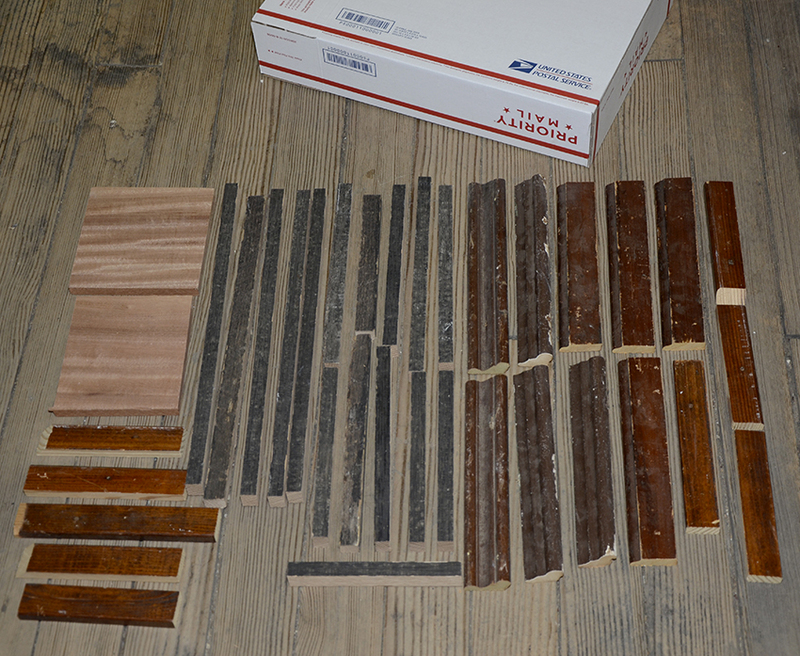 We selected vintage lumber that was 1 1/2″ thick from our wood warehouse for the shelving. 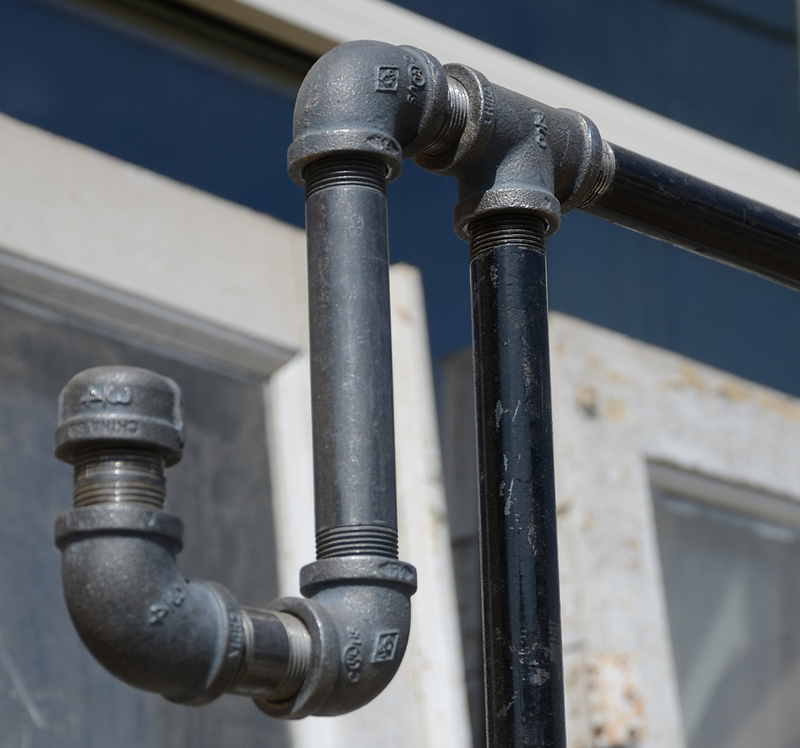 We purchased 3/4″ galvanized pipe to use on one of the racks and 1/2″ black gas pipe to use on the other two. Our tables have short legs on each corner making our storage racks stationery. These legs could easily be adapted with metal casters which would make the racks more diverse and easier to move around. Three side shelves were incorporated into this design. 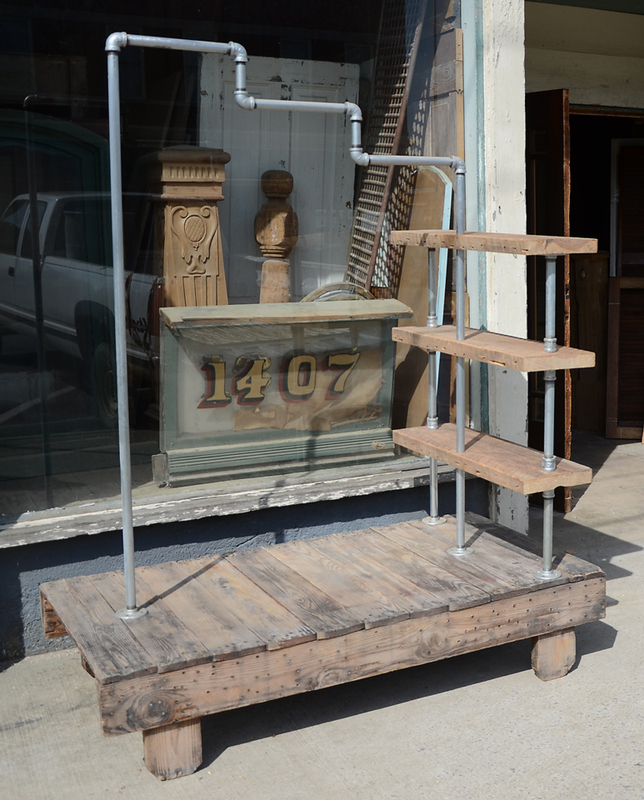 The galvanized pipe runs through each shelf, providing added stability for the shelves as well as the clothing rack. Although these tables will be used by Billy Reid to display items from his clothing line at Southern Makers, they provide a great solution for studio apartments or rooms where there are no closets or very limited storage space available. We love designing the very cool, industrial look of these units. The tables specific design is limited only by your own imagination. We have a great selection of the industrial tables as well as a warehouse full of salvaged wood available for your project! If you are heading to Southern Makers on May 3rd make sure you stop by Billy Reid’s booth and take a look at our creations!! We added full length shelves to this industrial table, further increasing the storage space. The side hooks are a great added feature for hanging bags and long coats. For those attending Southern Makers, Southern Accents booth will be close to the stage. Please stop by our booth and meet some of our team members. We will have salvaged items and t-shirts available for sale. We are looking forward to seeing familiar faces and meeting new friends! This past year Southern Accents built a couple of giant chalk boards for the Southern Makers event. Event goers were asked to chalk their answer to the question, “What Inspires You?” on the boards. The idea was such a huge hit that we constructed a second large chalkboard for the social media conference, Haven, in Atlanta. Each blogger attending the conference was asked to autograph our board. 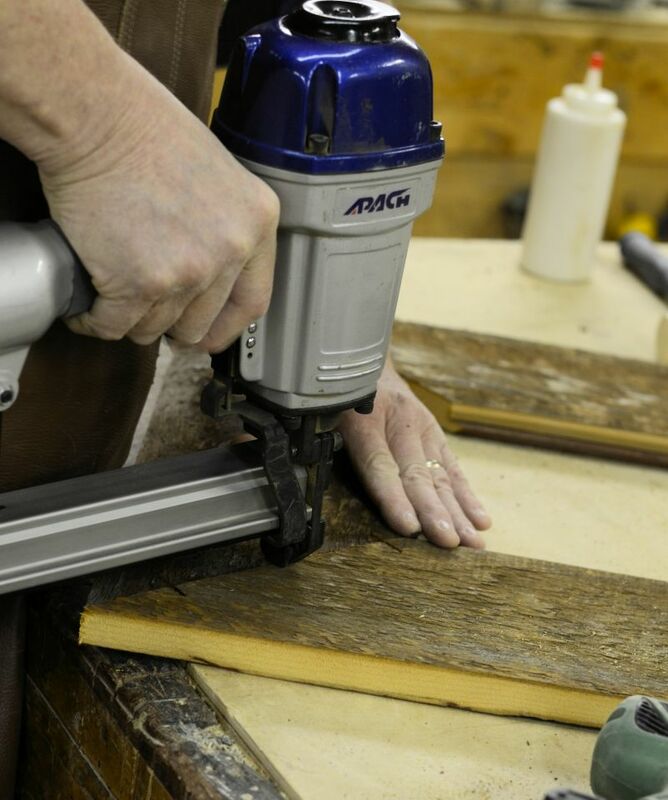 We have found a bounty of uses for these versatile boards and decided to share how we create our boards and frame them with salvaged materials. 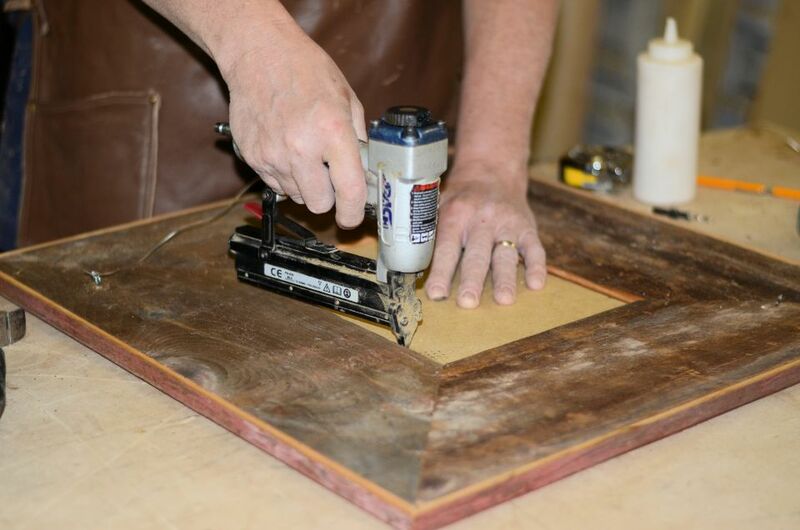 Our resident artisan Roger Long happily demonstrated the steps by creating a small chalkboard in our wood shop. Using 1/4″ multi density fiber board, Roger cut an 8″ x 10″ board using a table saw. The fiber board is inexpensive, provides a smooth surface, and can be picked up at your local hardware store. Spray chalk paint was used to coat the smooth side of an 8″ x 10″ piece of fiber board. 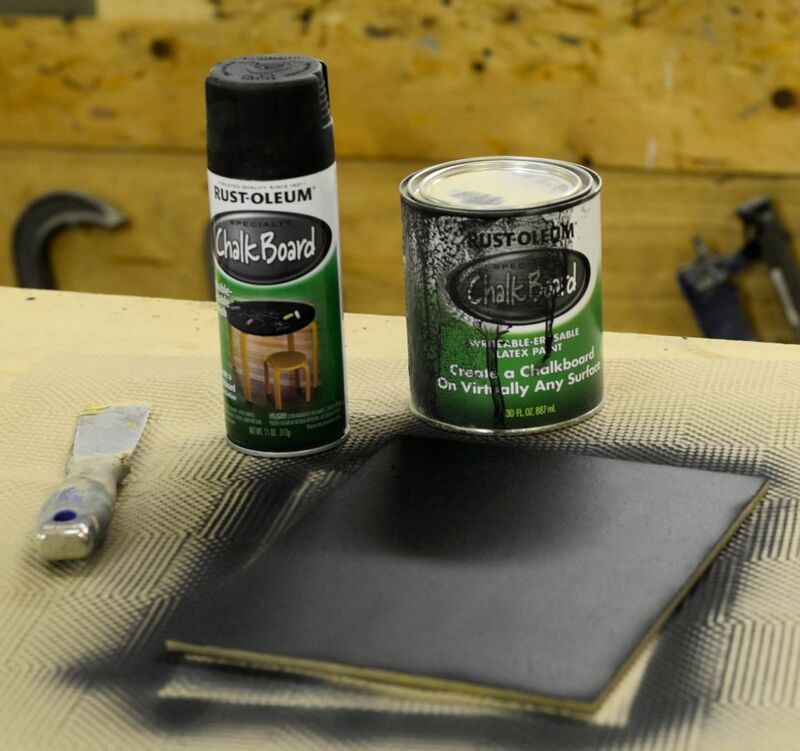 The smooth side of the board was painted using black chalk paint. The best method to use for a small board is spray paint. Larger boards can be painted using a smooth roller. Once dry, a steel wool pad was used to lightly sand over the first coat. The board was wiped clean with mineral spirits to remove dust particles and was given a second coat of paint. The board was then set aside until completely dry. 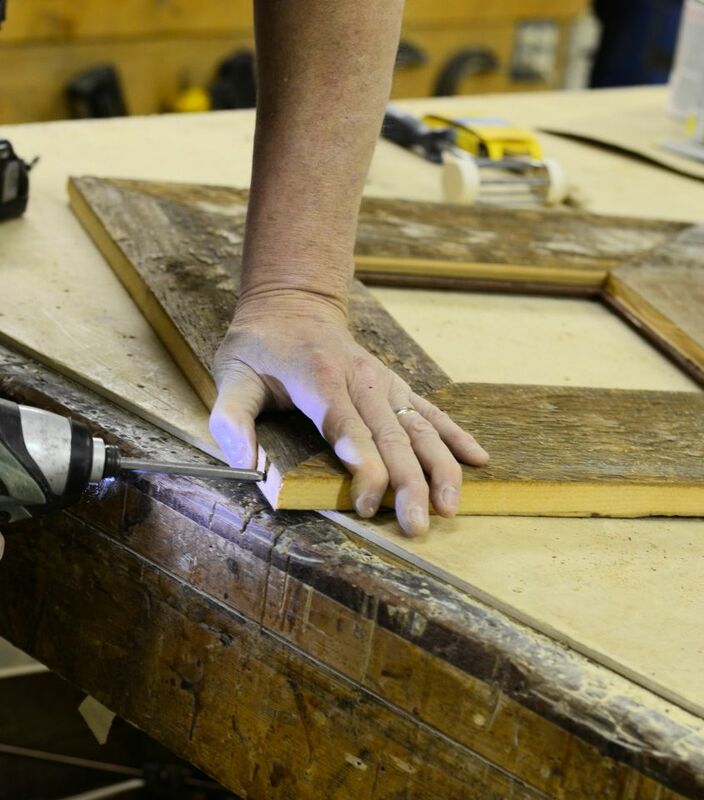 Roger Long cutting the salvaged wood boards to create the chalk board frame. To frame our board we chose some gorgeous pieces of red barn wood from our salvaged wood warehouse. These pieces originally had a tongue and groove, which gave the inside of our frame a natural lip to hold and attach the chalkboard. If using solid pieces of wood a router could be used to create the needed grooves. Another option is to cut the fiber board larger than the inside measurement of your frame and attach it directly to the back of the frame using small tacks or staples. Tongue and groove boards were cut and the edges mitered for use in framing our chalk board. 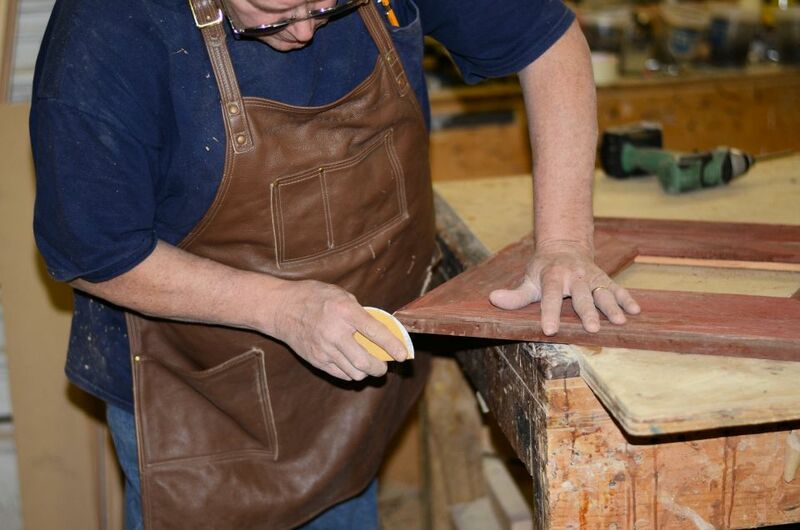 The wood pieces were cut to a common width and then cut to the required lengths to frame the 8″ x 10″ chalk board. If mitering the corners, extra length must be added to each side to accommodate the mitered edges. There are many great tutorials online that give step-by-step instructions on how to properly miter the edges. Roger is a pro so the corners of our frame looked fabulous when finished. Another option is to create a solid edge frame. 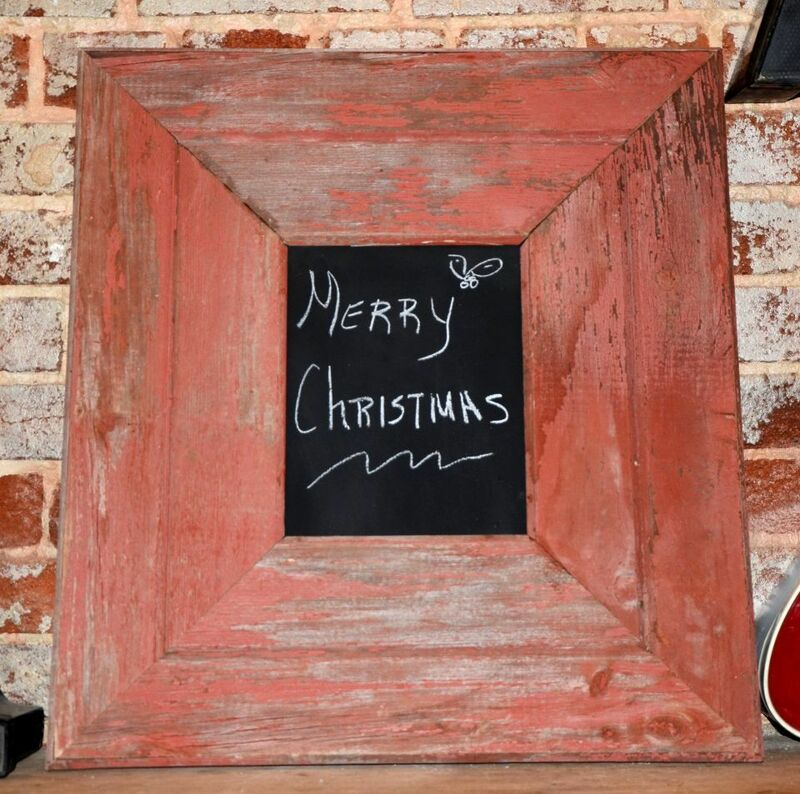 This eliminates the need for mitered edges and creates a more rustic looking frame for the chalkboard. Wood glue was used in the frame assembly. 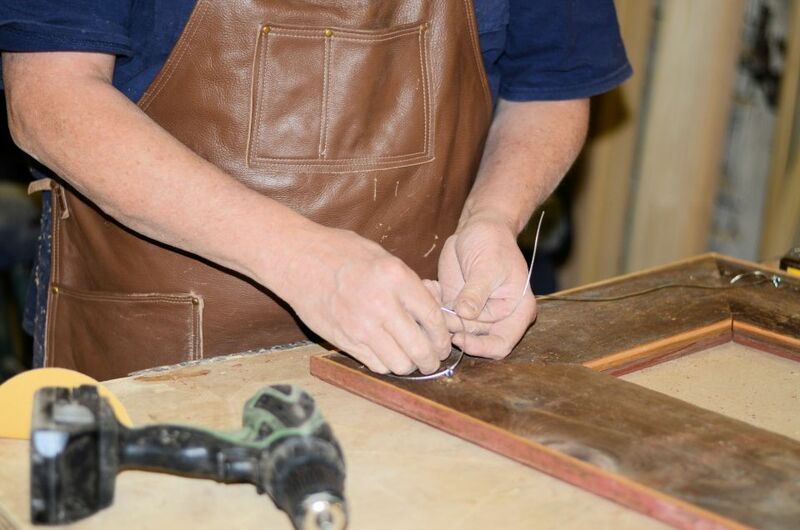 Once our pieces were cut, Roger laid them on the work table to ensure that they fit together properly. To assemble the frame he used a combination of wood glue and corrugated staples. The wood we chose for our frame was heavy so the corners were screwed together to reinforce the frame. After the pieces were glued, corrugated staples were also used to secure the corners. Screws were used in all corners to help secure our wood frame. Because the wood had to be trimmed to a common width, the outside edge of our frame was raw. 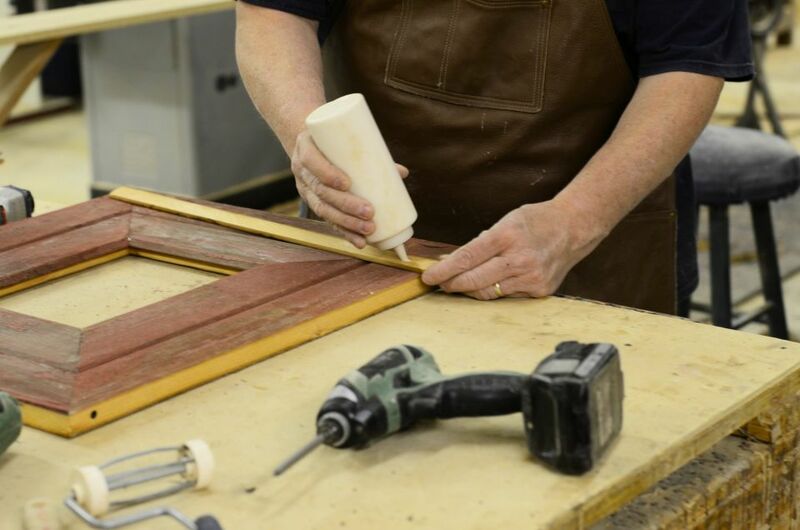 Using an extra piece of the red salvaged wood, Roger cut pieces of trim that he attached to the raw edges using wood glue and small staples. This gave the frame a very nice finished look. Wood trim was cut and attached to the raw edges using wood glue and small staples. Roger lightly sanded the trim at each corner, giving the frame a nice polished look. 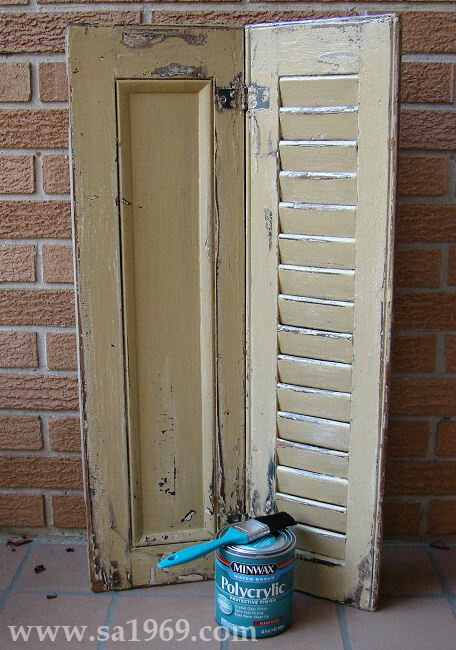 Once the frame assembly was complete and the glue given time to dry, the chalk board was attached and secured to the inside grooves with small tacks. Roger chose to use two small eye screws and wire to create a hanger for the board. The finished result was beautiful! There is something about old red barn wood that is simply irresistible! Small eye screws and wire were used to create a hanger. 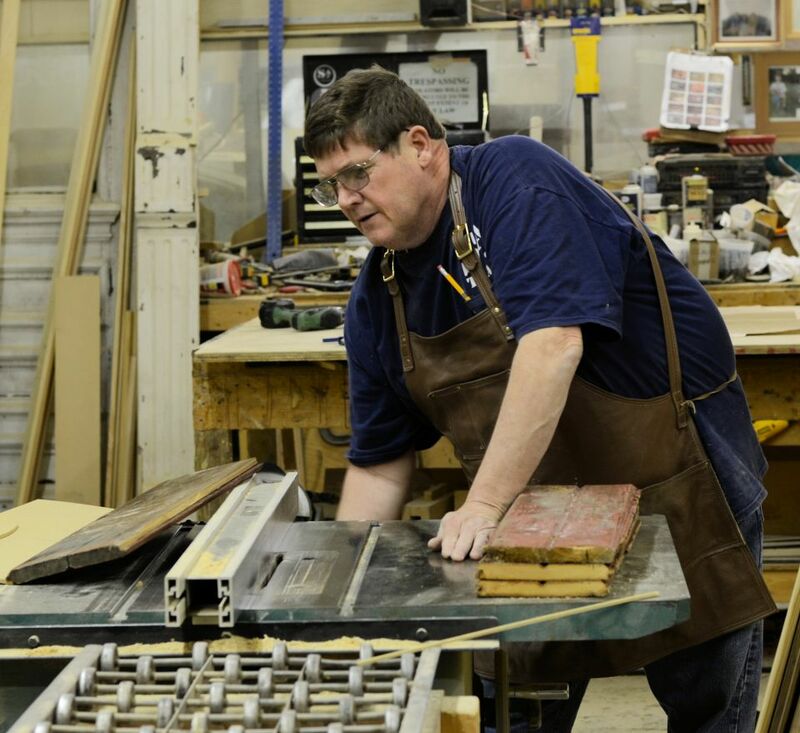 We realize that not everyone has access to a wood shop and all the right tools. Our goal is to demonstrate how salvaged items can be turned in to beautiful works of art and useful items. Our hope is that our projects will both encourage and inspire! One of our salvaged wood frame chalk boards used at a wedding this past summer. Last Saturday one of our team member’s youngest son married his best friend. 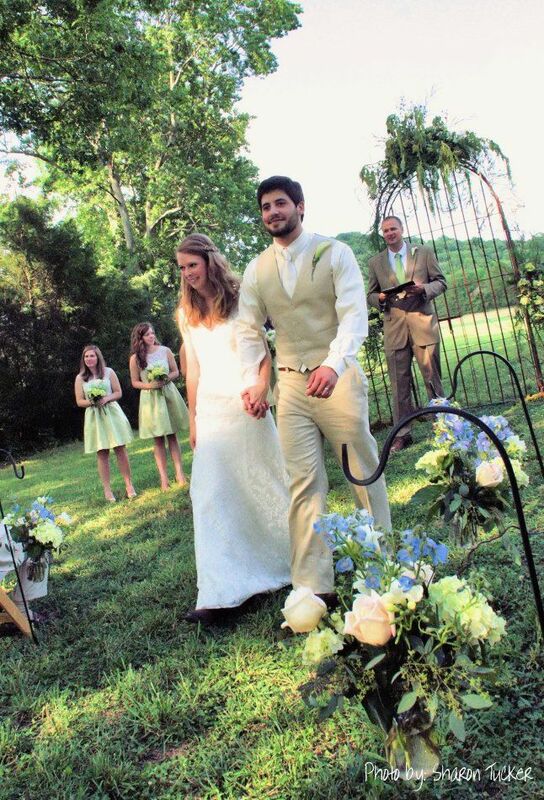 The wedding took place on a beautiful 600 acre hunting farm in the picturesque mountains of Fayetteville, Tennessee. It was a perfect day! Planning a wedding on a farm with a beautiful new barn, lots of trees, freshly cut fields, wild turkeys and deer grazing in the background, doesn’t require much more than what nature has already provided. Since we own an architectural salvage store and have access to some pretty incredible finds, we could not resist contributing a few elements from Southern Accents to this already amazing venue. The groom mentioned that he wanted some type of archway to use as a backdrop for the ceremony. 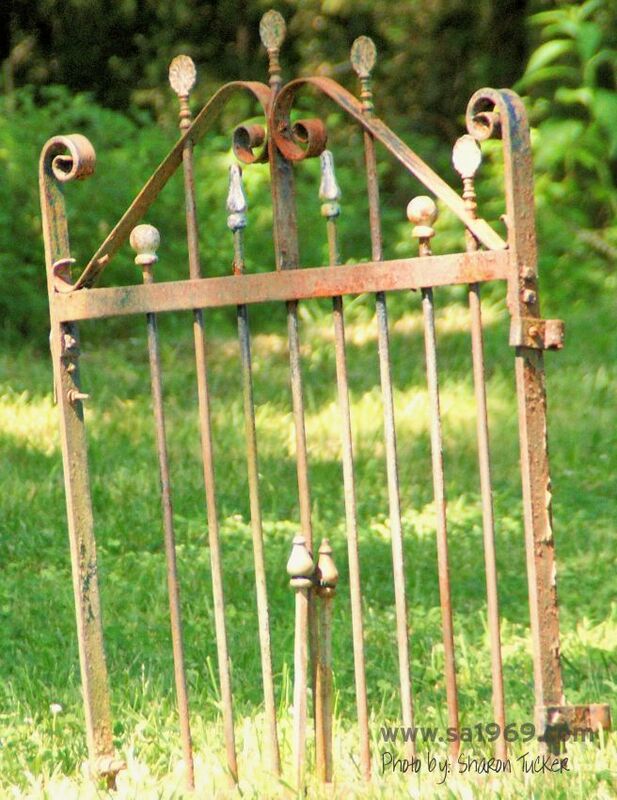 Garlan immediately pointed to an 8 foot, wrought iron, arched trellis and gate sitting on the iron lot. Our team member, and mother-of-the groom, admitted that she has been on that iron lot numerous times taking pictures of every corner, nook, and cranny, but never once noticed that very large piece of ironwork! How could she have missed it? If you have ever been to our showroom, you already know the answer to that question. We have so many beautiful works of art it is easy to overlook one element because your focus is on another. Each time you pass through our showroom you most likely will see something new just by focusing your eyes in a new direction. 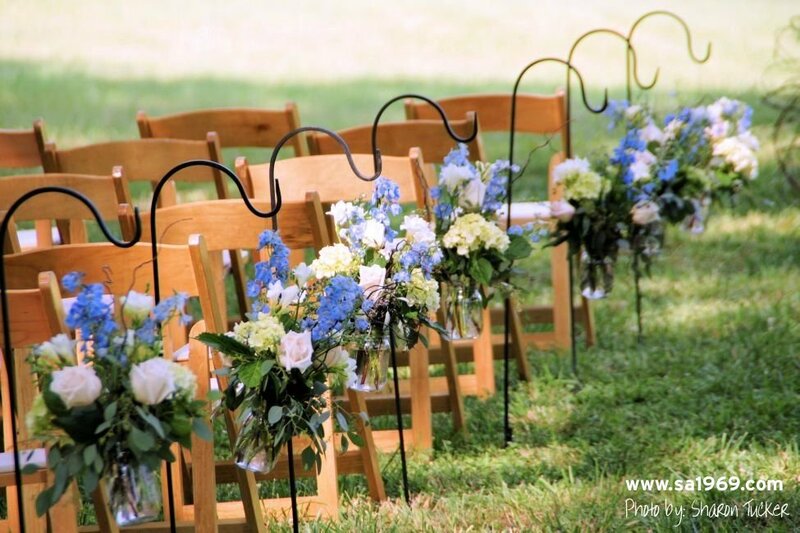 This wrought iron arched trellis and gates became the perfect backdrop for a perfect Southern wedding! The groom took one look at the arched trellis and thought it was perfect… exactly what he had in mind. The magnificent piece was disassembled and hauled to the mountains, along with a few other pieces found sitting around the showroom and tucked away in the corners of the warehouse. Once reassembled at the farm, the large wrought iron ensemble was decorated with hydrangeas and grapevine and became the perfect backdrop for the wedding ceremony. Although it could have been painted, its rusty state could not have been more appropriate for the natural setting the farm provided. 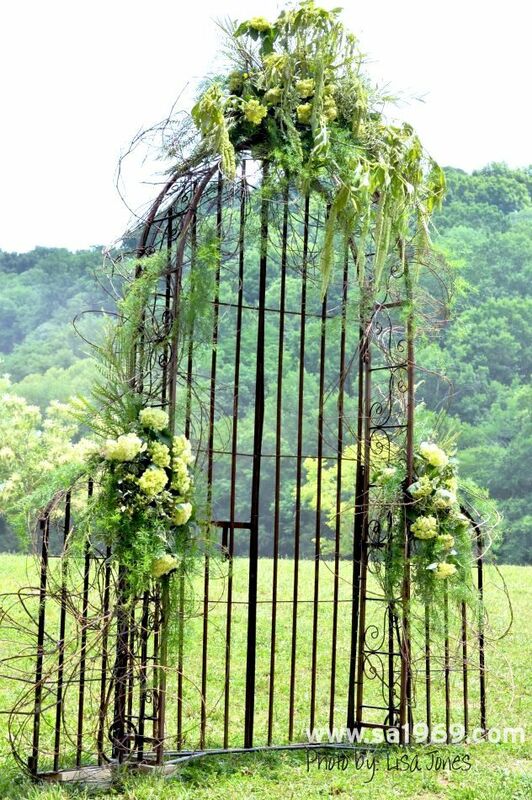 Two 1880’s wrought iron gates were used to create an entrance for the wedding guests. A pair of unique 1880’s wrought iron gates were also taken and used as an entryway for the guests. 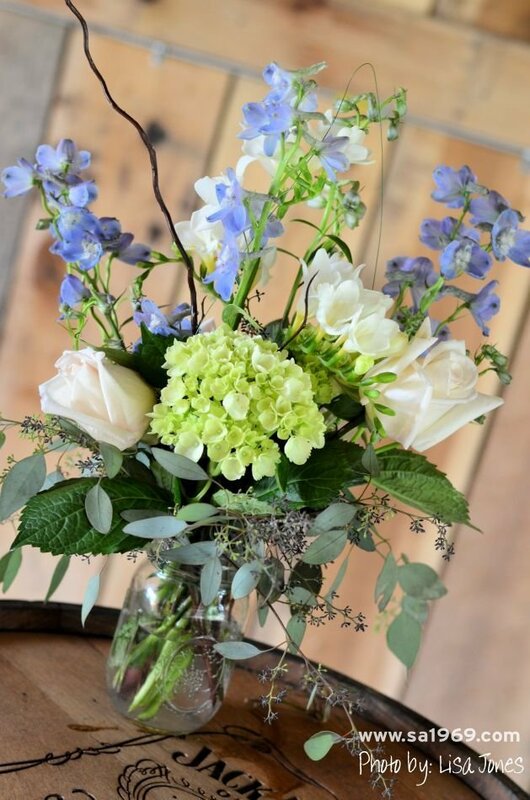 Mason jars were equipped with wire handles and hung on shepherds hooks at the end of each row of seats, each one housing a simple bouquet of hydrangeas. 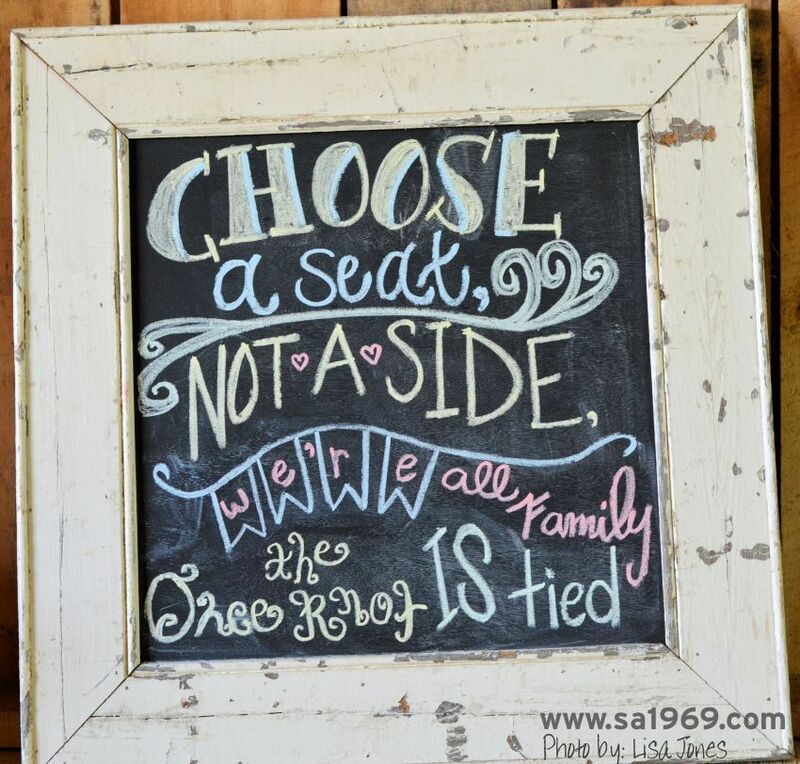 A custom chalkboard framed with salvaged wood was decorated with a sweet request from the bride and groom to pick a seat, not a side. 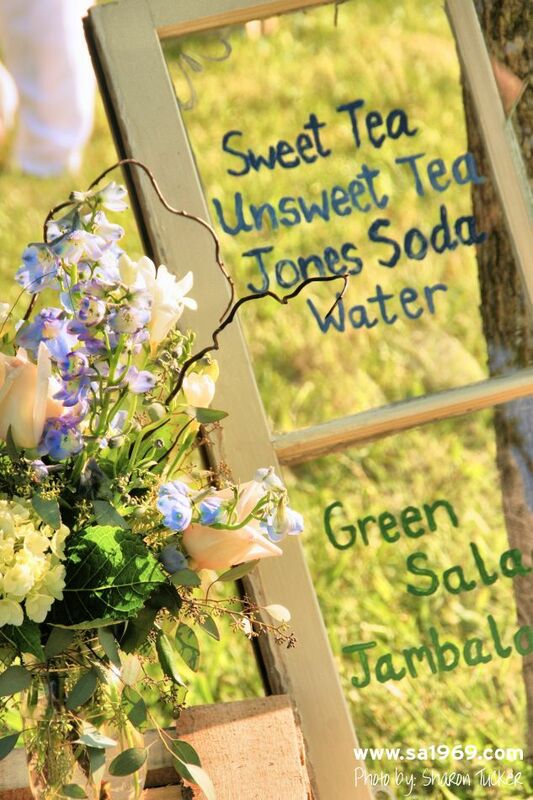 An old six pane window was turned into a menu board for the reception. 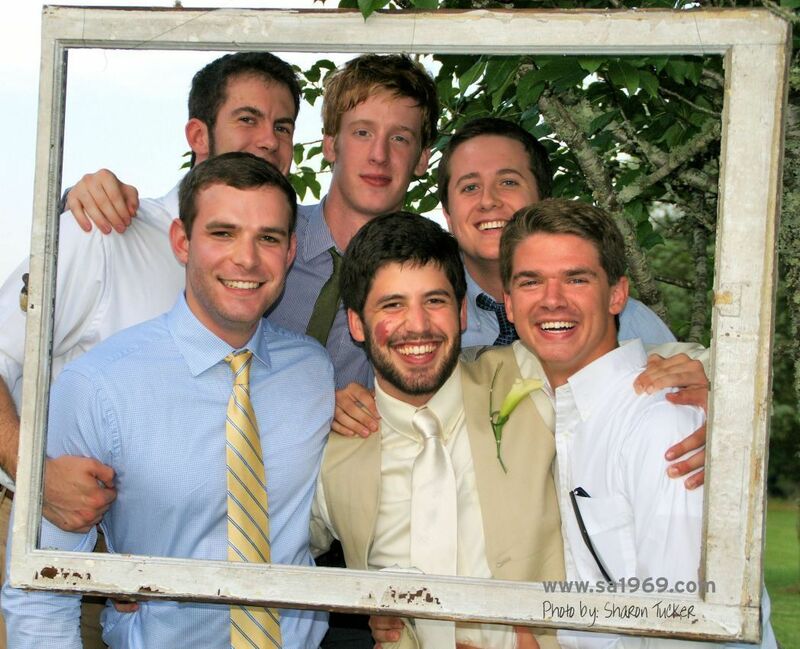 This wood window frame was hung from a tree and provided a fun picture op for the wedding guests! A final contribution from the store was one that provided some really fun picture ops for the guests! When digging through the warehouse we ran across a glassless window frame. The frame was hung in a tree and presented as a ‘picture frame’ for photos. The guests took advantage and some really fun photos, and memories, were captured. The antique and salvage pieces taken from Southern Accents to a farm in Tennessee are items that most likely were destined for a landfill before we rescued them. This past weekend they were repurposed and used to help set the stage for what turned out to be a perfect wedding. Visit our Pinterest page to view more pictures from this farm wedding and gather a few ideas of how you can incorporate salvage items into the décor of your next big event! This custom chalk board framed with salvaged wood was used to convey a sweet message from the bride and groom to the guests. 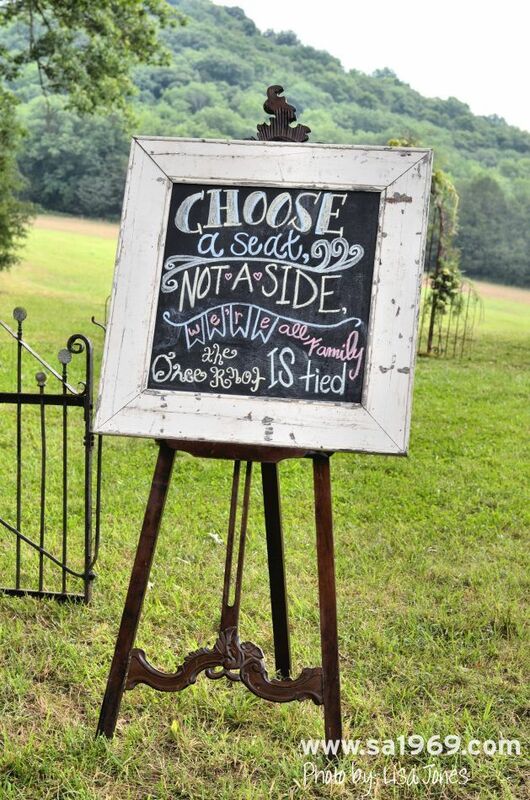 The chalk board was placed on a wood easel which greeted guests as they arrived. 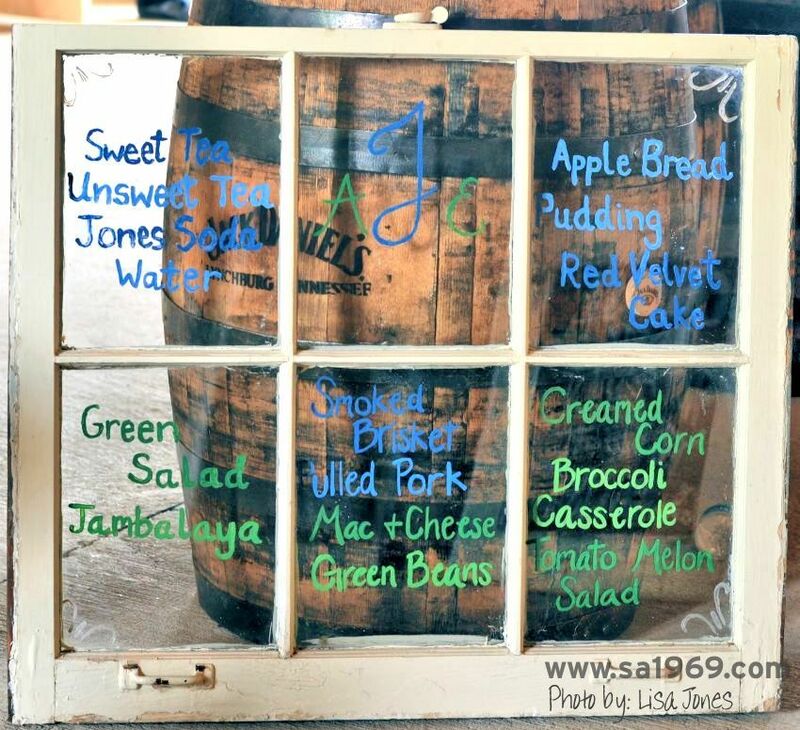 This salvaged window was used to display the reception menu. Each pane of this salvaged window was painted by hand and displayed at the reception tent. Mason jars were equipped with wire hangers, filled with small floral bouquets, and hung from shepherds hooks at the end of each row of chairs. Using mason jars was a great way to repurpose existing containers. Mason jars were also used as drinking glasses and added a definite “Southern” charm to this outdoor farm wedding. 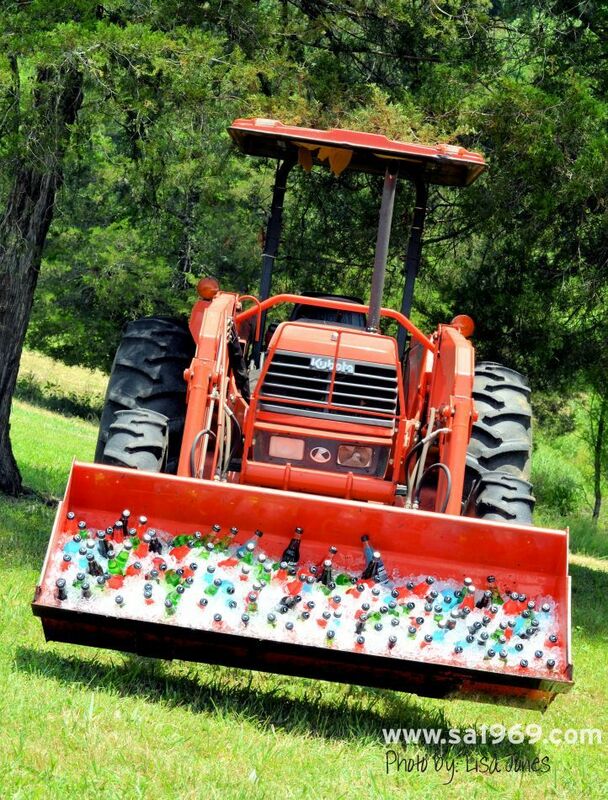 Making use of what was already on hand, this front loader was used to ice down soft drinks! 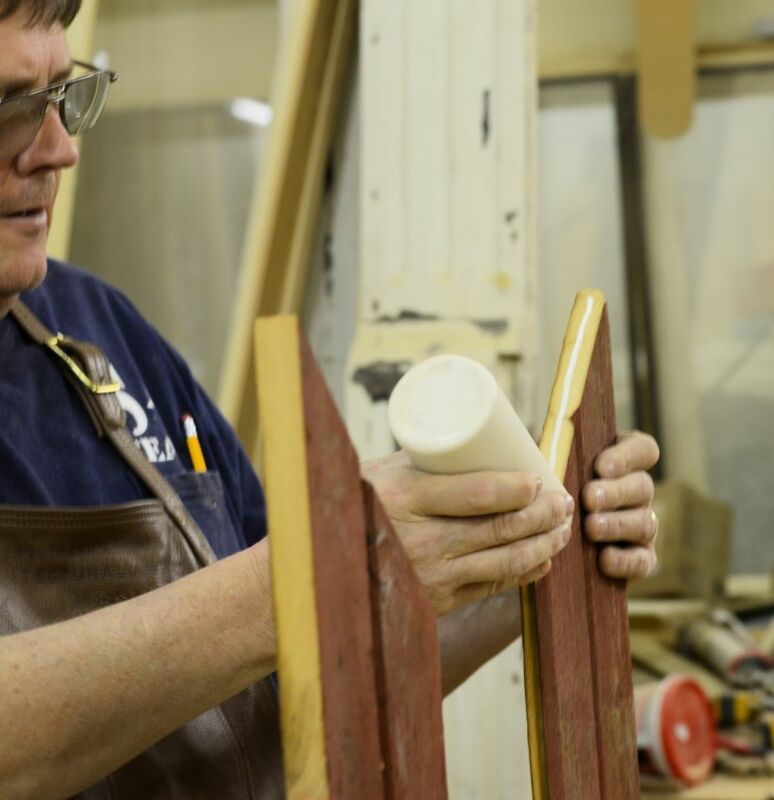 A frequent topic of conversation among our customers is the question of whether it is ever ok to paint a piece of antique wood furniture or architectural piece. There are several arguments that can be made in favor of painting, as well as taking a hands off approach, to leave a piece in its original stained condition. If your piece is a collector item and/or you are concerned about retaining the value, then you may want to take a hands off approach where painting is concerned. Most collectors want the finish of an item to be as close to the original as possible. If the original finish happens to be painted, the time worn patina not only adds character to the piece, but could also add value if it is original. Resist the temptation to add a fresh coat of paint or lacquer before you consult with an expert so that your hard work does not take away from its value. Another argument for retaining the original finish on a piece would be if it is a piece of historical significance. Any item that has a documented history should be kept in its original condition if at all possible. Even if the piece is damaged, restoring the damage usually will not increase the value. 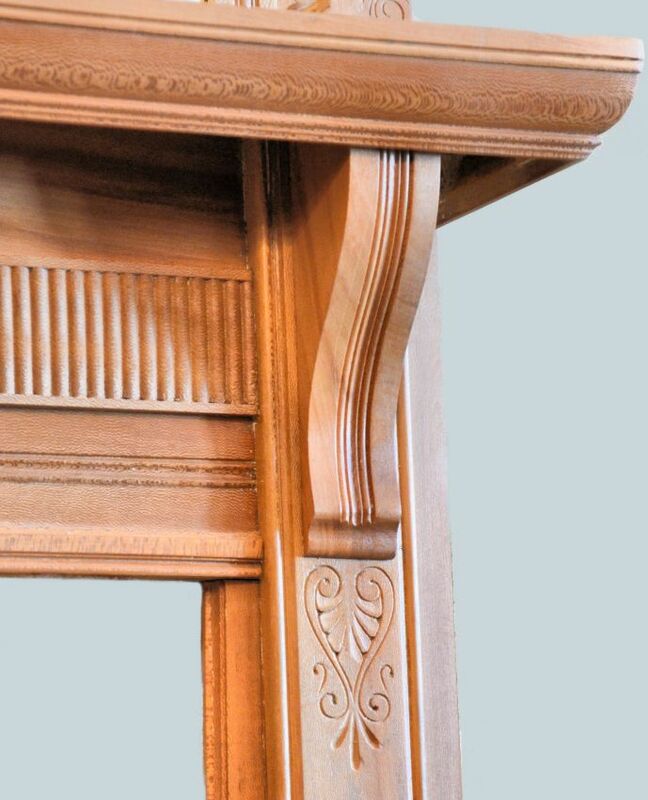 Birdseye Maple Mantel – circa 1890 from the Bruner house in Little Rock, Arkansas. We would also not recommend painting rare and exotic woods such as birdseye maple, curly pine and burl walnut, to name a few. The grain patterns of these woods are exquisite and rare. Covering them with paint, in our opinion, is a crime. We recently rescued a mantel that was covered with several layers of white paint. We decided to strip the paint from this mantel and were so glad that we did. What we discovered is that the wood beneath all that paint was birdseye maple. This discovery drastically increased the value of this historical piece. We were also thrilled to be able to uncover and expose the natural beauty of this rare wood. An argument in favor of paint is if your antique piece is one that you will keep and use in your home and retaining the value is not a concern. The finish may become more of an issue of personal style and coordinating your treasure with your homes décor. If the original finish does not fit the color or style of your room, painting can be a viable option. Beauty is in the eye of the beholder and, while the worn finish and imperfections of an antique piece might be prized by some, others might see it as an eyesore. While some collectors and purist would argue that it is never ok to paint an antique, the bottom line is that if you are the owner and the one living with the piece, you need to be happy with it. 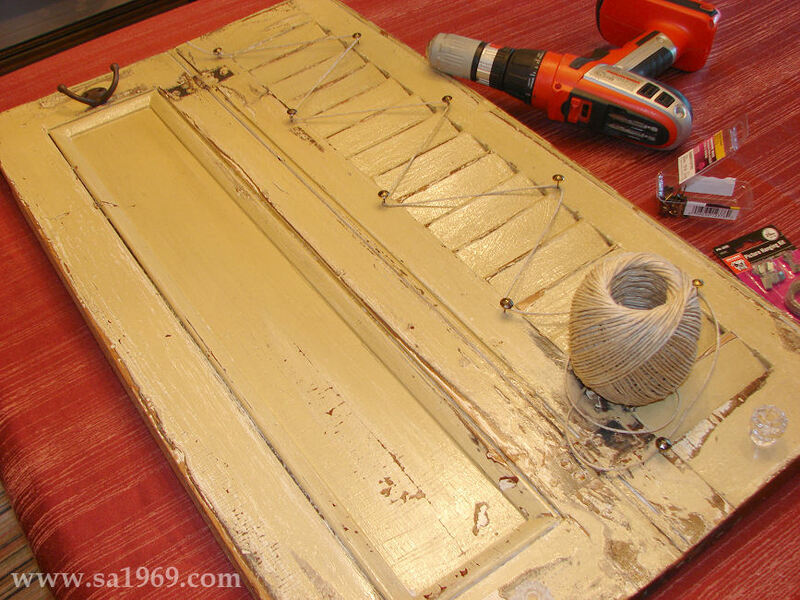 A nice coat of paint can give a needed face lift to a weathered door or add interest to a time worn dining room table. If you are considering painting your antique piece, we recommend looking at the Annie Sloan Chalk Paint®. This paint is easy to work with and requires little to no surface preparation. It can be used on just about any surface so its use is not limited to wood items. 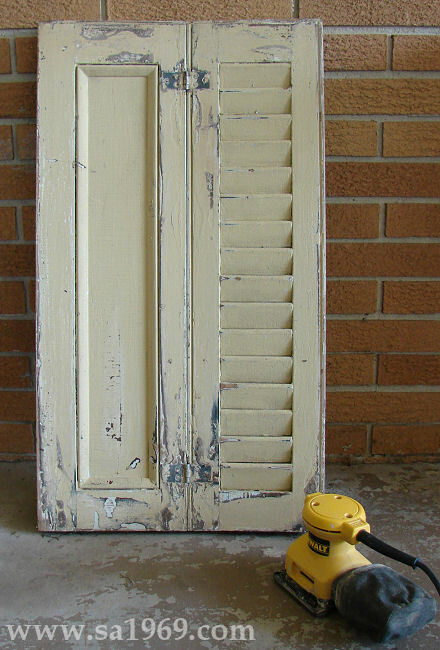 Various techniques can be used with the Chalk Paint® that will give your piece an old or antique look… or bring out the natural wood grain. This paint is available from our friend Teresa at Vintage West. If you are within driving distance of Cullman, Alabama, we highly recommend checking out Teresa’s Chalk Paint® classes! Another product that we highly recommend for stained or natural wood pieces is Briwax. Briwax is a unique blend of beeswax and carnauba wax that naturally cleans, stains, and polishes. It is available in clear and nine wood tones from Southern Accents. We do not recommend using oils. Oil can soak into the open grain of wood and over a period of time can turn it black. Natural wax however will help restore the finish and is preferred by collectors and most craftsmen. When I saw this shutter in Southern Accents I knew I had to have it. I guess you could say that it ‘spoke to me’! I loved everything about it… the size, the color, the fact that it had louvers on one side and a flat panel on the other. I knew exactly what I wanted to do with it! I’ve been in the process of transforming my daughter’s room from little girl lime green to vintage teen and this piece was a perfect fit. I hauled it to my trunk, dirt and all. I knew that I would not have to do much more than give it a good washing, which is exactly what I did. I literally took it out back to the water hose and scrubbed it clean with a stiff brush. I gave it a few days to dry and then took a palm sander and worked my way over the entire shutter. My goal was to sand off loose paint chips and further distress the finish just a bit. I absolutely loved the way it looked and knew that the color was going to look awesome against the chocolate wall. I dusted the shutter good and then gave it a clear coat of Polycrylic just to seal it and give it a clean finish. I dug around the store and came up with a double hook and a couple of clear glass knobs that I attached to the shutter. I wanted my daughter to be able to hang jewelry on the flat panel side and display pictures on the louvered side. I thought the louvers would hold the pictures nicely but they weren’t deep enough and the pictures flopped over. I came up with a quick fix that I think adds even more character to the shutter. I used some cool looking furniture tacks and criss-crossed some string in between. Perfect! All that was left was to add wire to the back so that we could hang it on the wall. She absolutely loves the finished project! She now has here eye on one of those ceiling tin magnet boards! 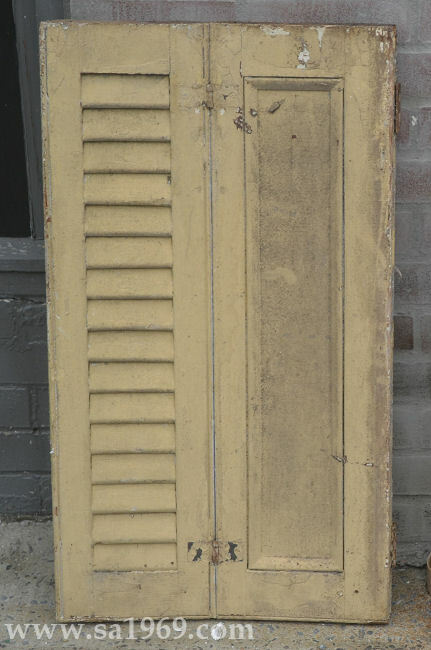 The guys at Southern Accents just unloaded a trailer full of awesome shutters. They will be going on the site soon or if you’re within driving distance come on by and take a look. 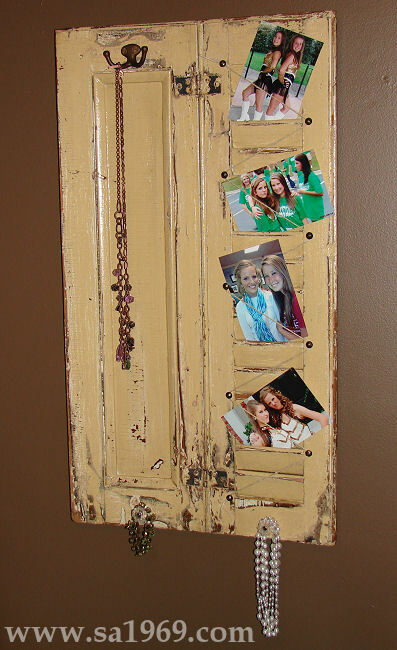 We would absolutely LOVE to see pictures of your shutter projects!! You can send pictures to info@sa1969.com or post them on our Facebook page.